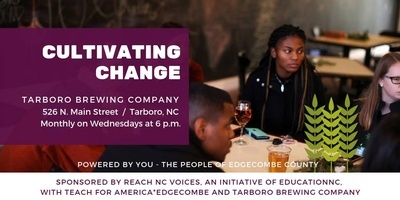 Cultivating Change is a monthly conversation series about the future of our community at Tarboro Brewing Company. We invite you to join us, share your thoughts, and enjoy free drinks. This event is powered by Reach NC, an initiative of Education NC, along with Teach For America*Edgecombe and Tarboro Brewing Company. Join us on the following dates, starting at 6:00 p.m.